For the 1994-1998 6BT engine with inline injection pump. 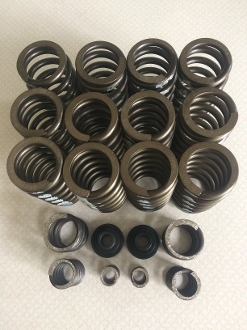 6bt kit sold as a set of twelve (12) Cummins #3916691 HD valve springs & a PDR 3000/4000gsk. If you want fueling to 4000rpm, install all GSK springs...if you want fueling to 3000rpm, leave the 2 smallest springs out of injection pump on install. If you plan on running a P7100 gov spring kit (GSK) or an exhaust brake, you will need HD valve springs. These heavy duty valve springs are required if you plan on running any application between 3200rpm to 3800rpm and/or up to 48psi safely and also required for the safety of your engine if you install an exhaust brake. Don't be fooled by people selling cheap GSK's and valve springs out there. A broken spring can take out an engine. Over 3800rpm, we highly suggest the dual valve springs.